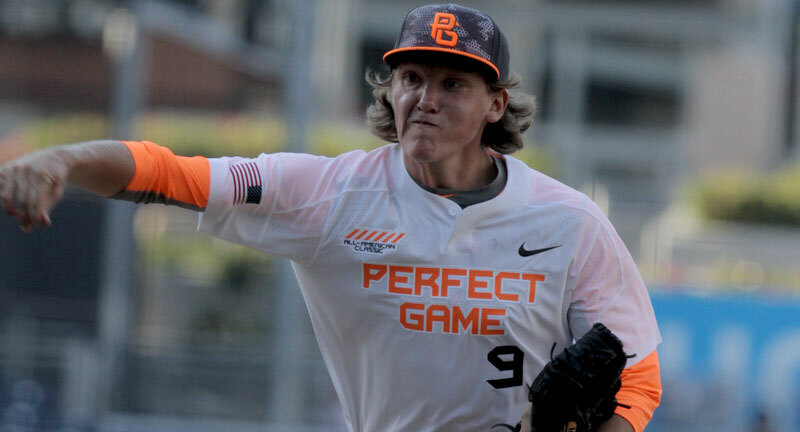 The 2018 college baseball season had an impressive number of Perfect Game All-Americans making an impact on the game. Kody Clemens was on fire, particularly down the stretch, on his way to guiding the Texas Longhorns to Omaha. Jonathan India had a huge uptick in power as he too led his team, the Florida Gators, to the College World Series and was also the fifth overall pick in the 2018 MLB Draft. Joe DeMers fired a perfect game during the regular season and fronted the staff of another CWS team, the Washington Huskies. Clemens and India were both named First Team College All-Americans for their impressive seasons. Three more players (Steven Williams, Logan Allen and Tanner Burns) were named First Team Freshmen All-Americans while Blake Sabol was named a Summer Collegiate All-American after his impressive summer showing on the Cape. Seventy-nine players are listed below, a number rounded up to 80 once Carter Stewart decides where he will play next spring. Kyle Molnar, not listed below, could have made it 81 had he remained at UCLA but instead has chosen to work out independently in preparation of the 2019 MLB Draft. Twenty-four of the PG All-Americans at the college level are true freshmen, leading another talent infusion for fans of the game to follow over the next 3-4 years. Vanderbilt leads the way with six total PG All-Americans while Kentucky, TCU and USC each has four. Players filtered by school. Year indicates the year each player participated in the Classic. Not shown below is 2017 PG All-American righthanded pitcher Carter Stewart, an unsigned first-round draft pick from last summer. Stewart has yet to determine where he will be playing during the spring of 2019.